Although Idrija is most famous for its mercury mine, the whole region has a rich natural heritage with many areas of outstanding value. Especially important is its geological heritage, which includes the mercury ore deposit, exposed stratigraphic cross sections, the Wild Lake, the Idrija Fault and the Habečkovo brezno natural shaft. This diversity and sheer geographical scale offers great potential for education and developing geotourism in the region. It is crucial to conserve this natural and cultural heritage, with many previous efforts have been put into such endeavours. The most important is Zgornja Idrijca Landscape Park where some features are additionally protected such as natural monuments and a nature reserve. In general, the conservation of natural and cultural heritage in Idrija municipality is enforced by three decrees, EU directives and national laws and regulations. Because of the importance of the Idrija region, since 2007 a large amount of effort has been put into the establishment of Idrija Geopark. In the past year, as part of the Leader project “Involving geological heritage in rural tourism for the Idrijca River basin (the region of Idrija and Tolmin)”, the first concrete steps towards creating this geopark have been made. This included making an inventory of natural heritage sites, educational activities for children and adults and research theses in cooperation with students. 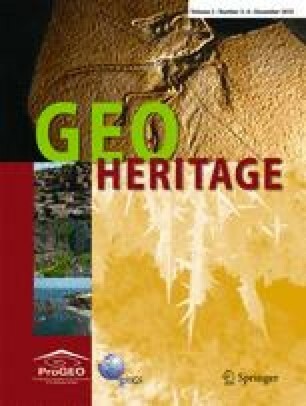 The evaluation of geoheritage has been completed and preliminary themes designed. In this way, the basis of the proposed Idrija Geopark is set out, and guidelines for conservation, education and geotourism in the municipality are determined. This paper is a result of 1-year project co-financed by Leader funds. The authors are grateful to Jože Čar, Uroš Eržen, Bojan Režun, Martina Stupar, José Brilha and two anonymous referees for their constructive comments that have contributed to improve the manuscript.